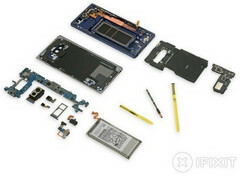 With a repairability score of 4 out of 10 awarded by iFixIt, the Samsung Galaxy Note 9 is considered to have a nicely laid out modular internal design that only uses standard Philips screws. However, to service any of the internal components the glass rear panel must be un-glued (and reglued at the end), and replacing the display is also very hard to do. Fixing many of today's smartphones can be quite a nightmare, especially when the problem that needs to be solved consists of a broken/defective display. Sadly, the Samsung Galaxy Note 9 is not a wonder from this point of view, as shown by the recent teardown that this device has been put through by the popular tech website iFixIt. All in all, the Samsung Galaxy Note 9 is a fine flagship — at least as long as it does not need a battery replacement or any kind of repair that involves an internal component. Given the 4 out of 10 repairability rating awarded to Samsung's latest flagship handset, would you consider buying another high-end device? Let us know about your Galaxy Note 9 alternative in the comments.